Erik Schjeide was born in 1954 in Santa Monica, California. He began woodworking in 1973 by attending a furniture making program at Borgund Yrkesskole in Spjelkavik, Norway. He later trained in a small shop where he earned his journeyman's papers (shown at left). As a journeyman Schjeide traveled Europe studying furniture design. He worked for a period in Marburg, Germany, in a shop that restored antiques using only hand tools. 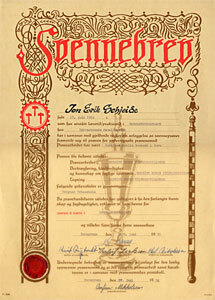 He later returned to Norway to complete his training and earned an Håndverksbrev, the modern equivalent of master's papers. Schjeide returned to the U.S. in 1978 and located his business in Berkeley, California. During the '80's he developed a line of uniquely carved furnishings. Made mostly of walnut or cherry, those pieces were inspired by art nouveau furnishings he grew fond of in Europe. Schjeide spent the '90's in Ashland, Oregon. During that time his appreciation grew for the Craftsman, Greene & Greene and Arts and Crafts styles. 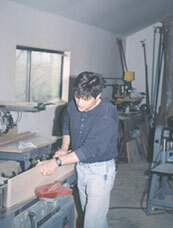 He was involved in remodels of many beautiful homes in the area and provided quality cabinetry and furniture. In 2000, Schjeide moved to the Northern California coastal town of Arcata. Since then, Schjeide has earned an A.S. at College of the Redwoods and a B.A. in Multimedia Design and Communications at Humboldt State University, where he has also taught classes in cinematography and audio production. Schjeide received an MFA in New Media from University of Donau Krems, Austria, and has completed his doctorate in Scandinavian Literature and Languages at University of California, Berkeley. Thank you for viewing erikschjeide.com.